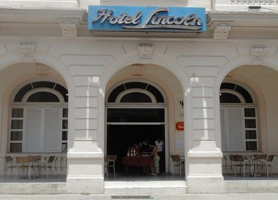 Hotel Lincoln was built in 1926 and is well located for access to Old Havana, Central Havana, Chinatown and Vedado. It is just across the street from one of Havana’s best Art Deco buildings, the Teatro America and from the Havana nightlife capital, La Casa de la Musica. The Havana Malecon boardwalk is just 2 minutes away by foot. The Hotel Lincoln´s newly restored restaurant is serves good value food for those looking for an economical dining experience in Havana. The Hotel’s lobby has elegant marble floors and tall mirrors, chandeliers and a bright pink marble check-in desk. 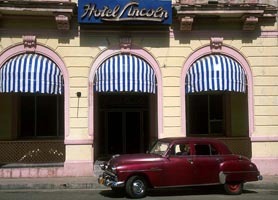 One of the quirks of Havana’s history took place at the Hotel Lincoln. On Sunday 23rd February 1958 Juan Manuel Fangio, five times world champion racing driver, was kidnapped in the lobby by a member of Fidel Castro’s 26th July Movement. Fangio was talking to the British driver Stirling Moss, when he was whisked away at gunpoint from the hotel into a waiting getaway car. The event made front-page news in Rome, Mexico City, Paris, London, New York, and Buenos Aires. The plan was to stop Fangio competing in a race which, the captors claimed, would improve the Batista government’s rapidly deteriorating public image. Mr. Fangio was released from kidnap without harm at the end of the race. Room 810 has been preserved as it was during Fangio’s stay, and is open to hotel guests for visits. In the evening, guests and friends can enjoy a Cuban show and dancing music on the hotel’s roof top terrace. 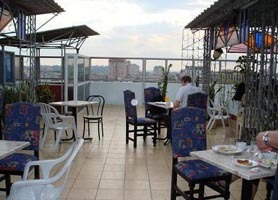 While being within the budget scale of hotel rates in Havana the Hotel Lincoln offers the Old Havana same views and experience 4 and 5 star hotel guests pay to get and while the accommodation is only 3 star, if youre view to visiting Havana is to see the sights, the Hotel Lincoln is perfectly suited to your needs. Hotel Lincoln Old Havana is usually in very high demand and, as such, should be booked in advance. Our booking program allows reservations at Hotel Lincoln without down payment or deposit which will guarantee your dates and also allows preferential modifications should your dates change in the future. 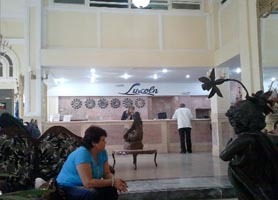 Our booking process is unique because it shows the best rate from all of these for Lincoln hotel in Old Havana and the types of rooms available. 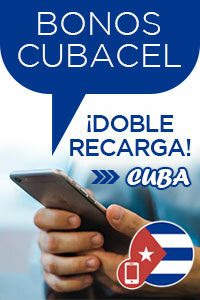 Our Hotel Lincoln Old Havana rate comparison is an industry first for Cuban Hotels. Once you’ve compared the rates, finalizing the booking at Hotel Lincoln takes just seconds and an immediate confirmation is provided in real-time.